Mark the date in your calendar. It is the day when the world will come to know about the shining 41 Gems of Digital India. If you still haven’t, register today for the event. 41 Gems of Digital India are innovative initiatives that are set to change the way governance is delivered. In many ways they are path breaking and a source of learning for others willing to undergo transformation. In short, they epitomize excellence. 1. They are revolutionary. Gems of Digital India are not mere digital initiatives. Each one of them is a holistic transformation story that involves massive changes at the policy, process and people levels. The catalyst of these changes is of course the digital technologies. 2. They are also evolutionary. It’s like a transformative revolution followed by continuous and gradual evolution. Each of them are continuously changing every day. 3. They have a hidden pattern or a framework that is at the core of their success. It may not have emerged through one big decision but may have become real based upon many micro strategies and decision. In other words a thoughtful leadership and constant course correction has led them over time to success. The Gems of Digital India initiative of Coeus Age Consulting is also different in three ways. Firstly, we did not solicit nomination, as is usually the practice with awards. We instead set on a difficult path of discovering those that deserve to be known. The year-long research involving 30 man months encompassed identification of 1600 initiatives, classification, shortlisting, jury and analyst selection and documentation. Secondly, we did not want to be content with just awards. Rather we wanted to document their journeys for others to read and benefit from. Each of the 41 Gems of Digital India discovered by us has a unique perspective to offer. As mentioned earlier, their formation, evolution and implementation has a hidden pattern, which is at the core of their success. We curated an insightful case study on each one of them that will take their success stories to many. 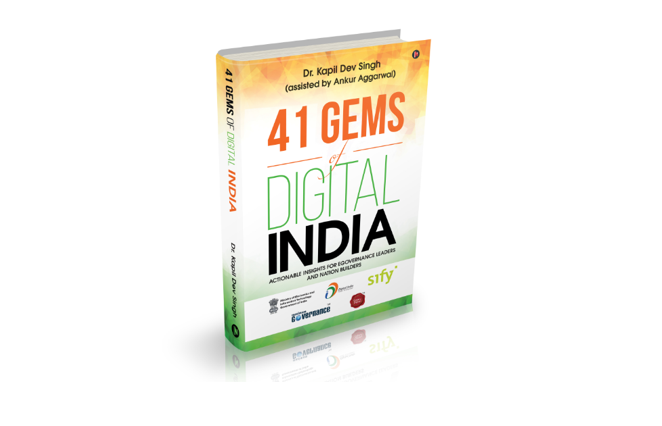 A book titled 41 Gems of Digital India – Actionable Insights for EGovernance Leaders and Nation Builders contains these case studies and a meta analysis. The book will be launched at the function on 7th of June, 2017. Thirdly, we would like the researched content contained in the book to kick start a meaningful debate for future evolution of the Digital India dream. We look forward to Digital India leaders and Technology Providers for starting a meaningful and change generative conversation. We want to learn and bring that learning for others. It’s been our effort for the past one year and will continue to be so in future too. We are delighted to have Dr. Ajay Kumar, Ms. Neeta Verma, and Mr. Debanjan Kumar as distinguished speakers at the Gems of Digital India Awards, 2017 ceremony. Look forward to seeing you there at the Shangri La, New Delhi on the 7th of June, 2017. The function starts at 9:30 AM and will conclude at lunch. If you still haven’t, you can register here.